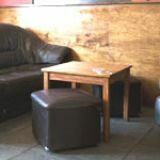 The Half & Half Lounge Bar offers punters a stylish venue which has a relaxed and comfortable vibe. Inside you will find a great array of Belgian and Czech beers and throughout the week you can catch a whole host of live music performances from local bands and artists. Do you work at Half and Half Lounge Bar? 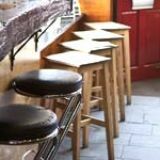 Tables and chairs to the front of the bar. What did you think of Half and Half Lounge Bar? When i'm in Croydon I always pop into Half and Half for a drink, would recommend with its chilled environment and good priced drinks. Great drinks menu with fantastic popular classic cocktails, premium bottled and draught beers, great wines and champagnes.Czech, Belgian, New Zealand, German imported beers, and while you are there try a pint of Half & Half - Original & Dark Budvar mixed together it’s great!! !Free private room hire with ipod connection Free Internet accessAnd lot more on offer so very recommended place to visit. Just beyond the skyscrapers and neatly planned streets of central Croydon, the low-rise old town is the place to head for old-fashioned pubs with character. 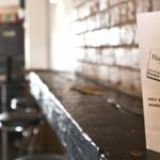 The Half and Half has long been a pub - in a former incarnation it was owned by a manager of Crystal Palace FC - but its offering these days is distinctly different, appealing to those in search of quirkier beers and hard-to-find wines. With its large windows looking out onto the High Street, its intimate size (there‘s room for 60-70 drinkers upstairs) and its simple brick walls, from the outside the Half and Half appears more like a house party in full swing than a pub. More discreet chats can be had in the fairy light-lit basement, which can accommodate another 20-30 drinkers on comfortable sofas. A surprisingly mixed bag of young and old, smart and dressed down, those in search of a specialist pint and those who just like the feel of the place. 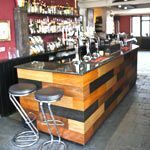 You’ll find a lot of couples, but also groups of friends, either stopping off for a quick pint before heading into the more hectic climes of the town centre or parking themselves here for the evening. There’s a soundtrack of credible house music, but at no point does it threaten to overwhelm the noisy but friendly sound of enthusiastic (rather than raucous) chatter. There’s definitely a family atmosphere to the clientele, though, as the landlord greets regulars by name and most people stand around socialising with each other rather than sitting in their own groups. There’s even live music, of an Irish folk flavour, happening regularly, as well as wine tasting evenings and talks from esteemed brewer Sambrook’s on the finer points of home brewing. Famous in beer circles as one of the only places in the UK to serve Budweiser’s Budvar Half and Half on tap, a pint of this mix of original and dark beers will cost you £3.40. The beers are definitely aimed at the specialists, with a great selection of unusual and rare brews on tap, from New Zealand’s 4% Mac’s Gold (£3), up to Belgian Westmalle Triple at £4.30, brewed from a recipe developed by Trappist monks and weighing in at a hefty 9.5% proof. Other rarities include a 9% Hercule Stout (£4.30) and St Louis’ cherry, raspberry and cassis varieties (£3.30 each). There’s also Savanna (£3) and Brothers mixed pear and strawberry and pear ciders (£3.50) on tap, a range of wines from Italy, France, New Zealand, Australia and Chile, from between £12 and £27 a bottle, and cocktails, popular and reasonable at £5.60 each. 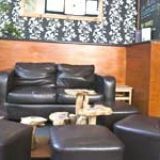 If you’re looking for a lively but civilised refuge from the hurly burly of central Croydon and enjoy a change from the same old brands, the Half and Half is definitely the place for you.